Golf cart batteries are one of the most versatile batteries readily available for a home solar power system or for someone just starting to live off the grid. You may think that this lowly battery has no place in the real world of energy storage, but it is applicable in some situations and can be relatively cost effective compared to other types of battery. This type of battery is typically referred to as “golf car” or “golf cart” battery. I am not an avid golfer therefore do not know the intricacies that make the distinction between a cart or car so we will stick with “golf cart” from here on. At first glance, this type of battery looks like something you might pull out of a car engine compartment that is used for engine starting. The difference being it only has three cells as opposed to six in a starting battery. There is an 8 volt golf car battery but the vast majority are the 6 volt type. While an 8 volt battery may be an advantage in a vehicle to reduce weight, for a residential home solar system, the 6 volt will be more cost effective. Most likely if you have had any exposure to renewable energy storage, you already know that a car starting battery is a very poor choice for supplying electricity in an off grid home. But, if you have been hanging around the battery section at the department store, you may have also seen something that looks like a car battery, it’s 12 volt, contains “deep cycle” in the description and sells for a reasonable price. You go home thinking that you have found the secret to the high cost of storage batteries. 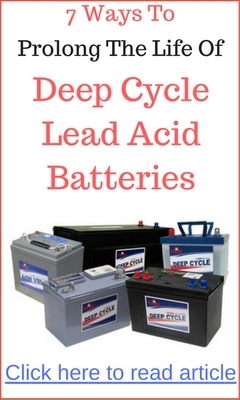 Before you decide to buy the “cheap deep cycle battery”, it is best you learn more about its properties. Why use deep cycle batteries for home solar system? We know that the lead acid batteries are chemical storage containers and can exhibit different characteristic depending on how they are constructed. With the 12 volt battery used for engine ignition, there are twice as many thin plates in comparison to the 6 volt golf cart batteries. The starting battery has much more plate exposure resulting in it being able to give up a lot of electrons in short bursts. On the other side, heavy charge-discharge cycles for prolonged periods of time can distort and damage the thin and delicate plates. Furthermore, the positive plates will corrode much faster than a true deep cycle battery – which results in a very short lifespan. 6 volt golf cart batteries, with its thicker plates, are able to endure long periods of deep discharging and recharging with less effect on its life span. Golf cart batteries certainly have their advantages in a residential solar system power bank. For the price, I would not hesitate to use them for a small load application or where larger batteries are not feasible such as in remote locations. If you are planning to use deep cycle batteries for your power storage needs, searching out the specs such as plate thickness would be advisable so you can do a little comparison shopping. Remember, you don’t have to buy new batteries if you are setting up a battery bank at home. 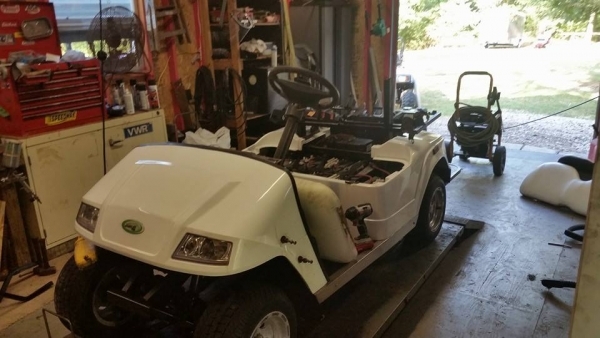 You can actually use old golf cart batteries and recondition them back into good service condition. 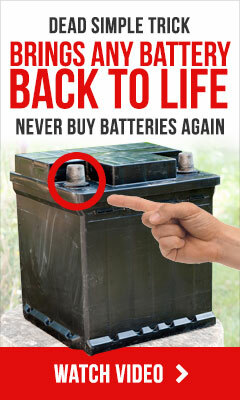 First, get old or used batteries for free (or dirt cheap) from golf carts service workshop. They will have a lot of used batteries lying around taking up space. Next, recondition them back to “like-new” condition. Doing this will save you a considerable amount of money when building a battery bank and it helps make alternative energy accessible to those with a tighter budget! If you are looking for a good deep cycle battery reconditioning guide, check out the EZ Battery Reconditioning program. The program has an entire section dedicated to recondition and bring dead golf cart batteries back to life. Click here to check out the program. Is it possible to do this on a mobile home(trailer)? If so, do I do the same as I would a house? Generally, the solar components for a home and mobile home is the same. As long as you have a sturdy platform to setup the solar panel, you’ll be fine. Some mobile homes use Direct Current (DC) electrical appliances. If you have DC equipment, you do not need a power inverter to change the battery DC to Alternate Current (AC). I have an infrared electric heater which I use in the winter. It says its 1500Watts. How many panels would it take to run this. ( It’s AC so an inverter would be required). What would the entire thing cost & how many batteries would be needed? Generally a small DIY home solar power system would be sufficient for your infrared electric heater. The size of the battery bank will depend on how long you are going to keep the heater on. 1 – 2 units of 12v deep cycle batteries should do the trick. To build the DIY home solar system, you would need a budget of approximately $600 – $900.